I yearly burn a DVD (used to be a CD when files were smaller) of all the cards and layouts I have saved over the year. Lately its mainly card ideas as I tend to no longer scrapbook but this past year I did a burn mid year and then I put it up on the hard drive then I started another file for my files for the last part of the year. Well about September I looked at my file and I was overwhelmed with it. I couldn't find anything, I just found it was useless to have so I decided if I was going to use these 1000's upon 1,000 of card ideas I have from the many of ideas I am getting in my email box daily I should at a minimum have them organized some how. So I started organizing the last part of the year in files by what kind of card they were. I had Birthday, Get Well you know all the basics then I had all these floral things with Hello and Thinking of You and Friendship stuff so I used those titles as files. and I even have a Floral file as of course there is a ton of flower cards without anything on them and then I had to get a little random and put cards in files that I had to say "well they were thinking of Birthday when they made this card". That one was a stretch but it was my stretch and my organizing so I was letting it go. Got to the end of the group and it was all organized and what do I do.... I go to my file for the beginning of the year and pull it into the nicely organized clean area and drop another 1,000 upon 1,000 of cards into it to be organized. What the heck was I thinking???? I was done I could just delete the other file or ignore it but no I had this file and it has card ideas I can use someday in it so......I spend another bunch of weeks organizing yet more cards until I get to the drags of cards and then I just delete (yes I deleted the last 50 + of them) it was hard and I had to look away while I hit that delete button but it was that or I was going to go crazy. I kept using the buttons to copy and paste but they were multiplying in my file and I was getting to the point if I saw certain cards again I was going to throw the computer. I think my computer was sick of them as well. Some were just ugly anyway - might have been since I had been looking at them so much but I hated the site of them. Now they are all organized and while there might be some doubles here and there even with my best attempts to not have any. I am human and do make mistakes. 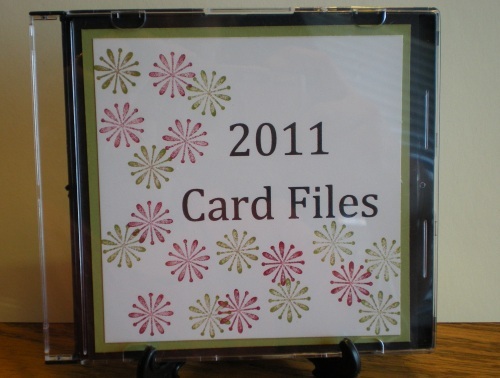 They are organized and on a nice DVD for all of 2011. 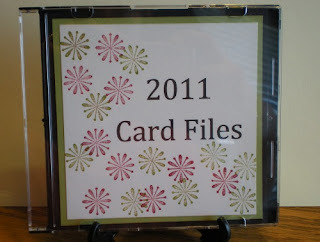 So here is a kicker on my story - yesterday the computer is being changed out and I had to upload the files to my hard drive so I decide to burn the 2011 card ideas to a DVD and I am now starting 2012 card ideas in 2011. It is actually driving me crazy that I am not being honest in my "year" so much that I woke early thinking about the files and how I am saving 2011 in 2012 folders. Pretty sad that I have an issue with that but I do. So one of the cards that came via email today had paper that I have seen so many times I just deleted instead of saving. Its not 2012 worthy. But on a positive note 2012 is starting out with nice tidy files that all cards will go into as I get them so I will not have the same issues I had this past year. Thanks for listening to my issues!